Exceptional customer care is the cornerstone to any successful business. Happy customers and the profits they generate are the very reason your company strives to market some of the best products and services. But how do you achieve a large and loyal customer base if you simply don’t have the economic resources or manpower to make it happen? Many organizations achieve their goals of nourishing customer relationships and boosting sales by partnering with a reputable outbound call center. Outbound call centers do much more than telemarketing, cold calling or upselling to existing clients. Some of the top outsourcing providers offer a host of scalable services, including appointment scheduling, customer feedback and surveys, data verification, lead generation and sales. Many upwardly-mobile businesses are shifting toward customer-centric practices and reaping the plentiful benefits of outsourcing. Consider the following advantages of partnering with an outbound call center. Fledgling businesses rarely have the funds necessary to ensure their customer service is 5-star from start to finish. Call centers have highly trained representatives who do more than just follow a script. These are agents who act as an extension of your brand and know how to build a positive rapport with potential and existing customers. They also have specialized knowledge in various industries and are adept at resolving a number of technical queries. Philippines call centers are able to provide superior services at significantly lower costs compared to hiring in-house personnel in the US, Europe or Australia. Not only do you have access to experienced agents at a fraction of the cost, you also save on training, overhead and technological infrastructure expenses. 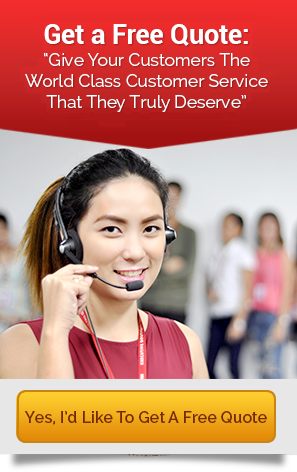 Access to a major talent pool of college educated, tech-savvy professionals is one of the main reasons why Philippine outbound call centers are thriving. Filipinos are entrenched in American culture, allowing them to relate to many customers, and grew up speaking English. Each representative is hand-selected based on his or her area of expertise to ensure your project or campaign is streamlined and productive. CRM tools used by outbound call service centers are critical for measuring important metrics, from call durations to hang ups and success rates. This precise reporting helps businesses follow performance statistics in real time and change strategies to foster optimum results. Small and medium-sized businesses can also benefit from cutting-edge technology, which means their customers can interact with agents 24 hours a day, through various platforms, no matter what the time zone – all at affordable rates. Modern call centers have Automated Call Distribution, Cloud Routing and the technological infrastructure in place to efficiently handle large volumes of customer traffic. Executive Boutique Call Center has rigorous recruitment and training standards for all prospective agents and offers outbound call center services to companies around the globe. Call us today to find out how we can help you optimize productivity and deliver a better customer experience. When people speak about your company, what do they say? Would they say they love your products and the service you provide, or do they just see you as another company? Hopefully it’s the former… we’ll rephrase this… it should be the former. Customers pay attention to the care you give, if it’s personable and efficient it makes an impact. This is also true for sub-par customer service, it makes an impact, but not the type you want. One route thousands of companies in the United States have taken toward customer service excellence is the outsourcing of these operations. Outsourcing customer service yields many benefits, and each company that decides to do so does for their own reason. Most companies are happy with making this decision, with 78% of businesses worldwide feeling positive about their outsourcing partnership. Why are all these businesses happy with their decision? This is a given. “Cost-cutting” is the top reason for outsourcing among companies that currently partner with an outsourcing company. But there are many areas that we don’t typically think of when we calculate costs. Costs incurred from renewing subscriptions to cloud services or printing new training materials are no longer a part of the picture. Not only will you save money, but you’ll make money too. According to a study conducted by American Express, 2 out of 3 consumers are willing to pay more for exceptional customer service. Your employees should wear many hats, but there’s such thing as too many hats. You can free up your employees’ time to perform other, more important tasks, while your outsourcing partner can handle those time-consuming customer service issues. Providing top notch customer service requires constant re-evaluation of practices, and when adjustments are made, the staff will require more training on any new procedures. Hiring employees that meet your company’s needs and standards takes time, anyone who’s been on Indeed and seen the same job posted every week knows that much. When you outsource your customer service operations, you give yourself access to a wide range of talent. With around-the-clock service, live chat, and services like Automated Call Distribution (ACD), it’s safe to say that outsourcing customer service means that they’ll be more efficient. In the event of power outages or cyber attacks, you can take comfort in knowing your customer’s information is stored safely in a cloud, set up by your outsourcing partner. Technology is growing ever-more important in today’s business climate, and having access to software and equipment that’s reliable is key to maintaining a successful customer service operation. Not every company wants to spend the money on setting up equipment or paying companies for disruptive on-site installation or take the time to set up live chat on every one of the office computers. Partnering with an outsourcing company means that your company will keep up with the times, and your customers will never have to deal with faulty systems and choppy connections. Streamlining your customer service operations could revitalize your company, and any organization struggling to keep pace in the current consumer environment could use a second wind. Here at Executive Boutique Call Center, we have the means, talent, and technology to breathe life into your customer service operation. If Live Chat isn’t part of your customer service support, then you’re missing out on valuable opportunities to improve. Online messenger used to be seen as a “nice add-on,” but today’s B2B buyers and consumers come to expect Live Chat as part of a comprehensive customer service department. Responsiveness is now easier than ever with Executive Boutique’s outsourced Live Chat, available to your clientele 24/7. Low-Cost Customer Service: Live Chat customer service is 17-30% cheaper than a phone call, allowing agents to help three or more customers at one time, according to Forrester Research. More Effective Lead Generation: Live Chat increases conversions by 20% or more, with a 300% ROI rate for the average sales team (American Marketing Association). Up to 77% of customers won’t buy from a site that doesn’t offer Live Chat support. Improved Customer Satisfaction and Loyalty: Live Chat has the highest customer satisfaction levels at 73%, compared to 61% for email support and 44% for phone support (eDigital Research). Live Chat gives 90% of customers confidence that they can get help from the brands they’ve chosen if necessary (Oracle). In fact, 63% of customers say they’re more likely to return to a site that offers Live Chat. Meeting Customer Expectations: 42% of customers say they prefer Live Chat to email, social media, or forums. They like the ability to multitask and shop while having their questions answered (JD Power & Associates). These days we’re all so busy. People like that they can have their questions answered, without being put on hold or transferring from queue to queue. Offering Live Chat lets you serve more customers, making the most of your time. The average Chat inquiry is answered in 42 seconds, thus reducing the amount of time a customer has to consider investing time and money elsewhere. With online support, you can offer a personal touch, which is particularly crucial when customers have items in their shopping carts. Give Live Chat the attention it deserves. Live Chat requires its own specialized training that may differ from phone or email support training. Using pre-written templates, cheat sheets, FAQ’s, and going over patterns in Live Chat inquiries will improve your customer service in this unique department. Prioritize your communications with the busy Live Chat cohort. While you may have 10 hours to respond to an email, you can’t let a chat request go more than a few minutes before users abandon your site. Failing to answer Live Chat inquiries will lose business and customer loyalty. Live Chat needs go beyond 9-5, with support 24/7. Be prepared for traffic spikes. Agents can handle multiple interactions at once, but peak seasons can cause floods in demand. Having enough trained agents prepared to handle increased requests ensures seamless operation. Be proactive. Don’t wait for prospects to contact you. Have automated technology in place to greet website visitors when they first arrive on the site, when they visit key conversion pages, after a set amount of time browsing the site, or once items have been added to the shopping cart. Connect your Live Chat correspondences with your in-house CRM. Ultimately, Live Chat should fit into the bigger picture of lead nurturing, conversions, and loyalty. Get each customer’s contact information and keep record of your interactions to understand the customer life cycle and maximize your relationship. Following up after a Live Chat experience kicks your service level up a notch. Should You Outsource Live Chat? You are looking to reduce costs associated with customer service. You don’t have the time or staff to handle FAQ answering. You have internal resources, but your team’s time is better spent doing what they’re already good at. Test the waters to see if Live Chat is right for your business, using a flexible team of trained experts. You know you need Live Chat to succeed, but don’t have the expertise to reach its full potential. You have an in-house team, but their hours and willingness to work holidays/weekends/overnights is limited. Your dedicated staff from Executive Boutique gets trained to know your business inside and out, acting as an extension of your in-house team. Our agents have the operational skills to service a number of requests any time, day or night for peak efficiency. Outsourcing Live Chat gives this channel the specialized training it deserves, but at a lower cost. You can scale up with additional employees during busy times or scale back down when times are slow. You don’t have to worry about hiring, firing, employee benefits packages, or scheduling hassles. Instead, you can have confidence that your Live Chat team is operating seamlessly in the background at all times. Contact Executive Boutique to learn more about outsourcing your Live Chat to our Cebu City, Philippines call center. Maintaining an open line of communication between service staff and management is one of the most helpful things you can do. Even though it is easy to see customer service as a low-skill position, quite the opposite is true and the impact of your representatives’ work on your company is undeniable. The more comfortable your representatives feel about communicating with management, the greater insight management will have into making positive decisions for the staff overall. Having good relationships between management and your service team helps maintain morale, motivation, and support. Every moment that you spend communicating one-on-one with one of your representatives is valuable. Management can often make the mistake of thinking of their representatives as disposable, rather than take the time to help them develop and improve in their work. Take the time to provide encouragement to your staff. Let them know when they’ve done a good job, and give them plenty of constructive feedback when there is room for improvement. Connect with them, maintain that line of communication, and watch your representatives blossom. It’s easy to lower staff morale by accidental negligence. Since customer service can be seen as work that requires few skills, workers often lack the equipment and resources to do their job correctly. Poorly-performing equipment (phones, computers, workspaces) can lead to delays and lower service quality, potentially decreasing customer satisfaction. Ensuring that your staff has the proper resources to do their job can motivate them to do their best work, which benefits everyone involved. Providing thorough, proper training is another great way to ensure that your representatives are prepared to provide exceptional service. These trainings can help your staff develop skills, but can also be used to boost team morale. You don’t have to wait for your employees to burn out to get them back on their feet. When in doubt, provide clear communication and support. Customer service is the face of an organization, and while the methods for delivering that service have changed, the goal remains the same. You want your customers to feel good about your service. It’s for this reason that many companies have started to implement live chat into their customer service operations. Traditional phone-only communication is now coupled with live chat, and many companies are seeing the benefits of using this hybrid formula. If your organization has been tossing around the idea of implementing live chat into your customer service but still don’t know if it’s a good fit, we’ve provided a run down of benefits which could help you in your decision. Anyone who’s been tasked with setting up a call center’s phone lines can probably tell you not only how time consuming it is, but also about the costs. Setting up phone support is expensive and involves a variety of factors that must be in place before it can go operational. Implementing live chat support only takes only a few steps and requires less of an investment. Some companies take this a step further and outsource their live chat for even more efficient operations and less costs. A large part of the population are visual learners, meaning that no matter how many times you lay out a solution to them over the phone they still won’t truly get what you’re saying. One benefit of live chat is being able to show a customer what you’re talking about. Whether it’s a product guide, screen sharing, a graph, or an animated GIF, visual aids can help customers better understand their issue and the solution. No one likes being put on hold, and a call into a company’s customer service department is almost certainly going to result in one. Live chat eliminates this issue by putting a customer directly in contact with an agent. Customers want answers, quick. In fact, Forrester Research found that 57% of customers will abandon their purchase if their questions aren’t answered quickly. They also found that 44% of online consumers find live chat to be one of the most vital features a website can have. Chat support provides agents the tools needed to guide customers through step-by-step instructions. Agents are also able to handle multiple customers at once, adding an extra layer of efficiency to your operation. Learning about your customer base is the best way to create an experience that they will remember. Live chat can help you do just that. A comprehensive live chat software comes with features and tools that provide insight into customer behavior. Customer data and relevant customer analytics can give your company insight and help you identify problem areas in your customer service experience. As you can see, implementing live chat can help your company continually modify its customer service experience to accommodate a changing customer base. If you’d like to learn more about live chat, or even outsourcing your live chat operations, click here. Customer service is more important today than ever before, considering that people now have extensive options for products and services available with the click of a button. Providing a customer service experience that leaves people wanting more cannot be obtained simply by slapping a headset on an agent. Instead, it has to be developed through training and practice. We’ve provided some ways to revamp your customer service experience – many of which are currently being used by industry giants today. More companies are using live chat in addition to their traditional telephone customer service, and the resulting benefits are clear. Statistics show that many customers prefer live chat because it allows them to perform other tasks at the same time. Knowing that you’re not taking a customer away from their day’s plans can provide a positive experience for both parties. An inescapable part of customer service is at some point saying “no” to a customer. The guilt you feel for saying no doesn’t mean you’re a bad worker. In fact, it makes you a better agent since you are identifying with the customer’s issues. When saying no, remain sympathetic with the customer, but don’t promise anything you can’t deliver. The best way to prepare for real world customer service issues is to roleplay with other employees during training sessions and meetings. Not only does this provide an opportunity for creativity and even some fun, the more hypothetical situations you’re exposed to the more prepared you’ll before anything that arises. According to Spiceworks’ 2019 State of IT report, 43% of financial service organizations have implemented IT automation into their operations. Automated services, when applied to customer service operations, increase efficiency and reduce call abandonment rates. Customers are also more likely to prefer a callback later as opposed to staying on hold for an extended period of time. What started as a way for people to connect with friends and family online has become a vessel for everyone around the world to display their thoughts; great news for companies in good standing with consumers, bad news for those that mess up those interactions. You can keep a good reputation with your customers by constantly checking your social media accounts for any messages or mentions, keeping an eye out for anyone venting frustrations. If your company is called out publicly, it’s better to address it head on. Many times, just replying to a customer is enough to let people know you care. Have you ever heard the saying “it’s not what you say, it’s how you say it?” A large percentage of customer service calls will end with no solution for the customer’s problem, but they can end on a positive note. Maintaining a firm, confident, and sympathetic tone with your customers keeps you in control of the call, while also validating their issues. You may be surprised when you start receiving good feedback on what you perceived as a negative issue for the customer. Finally, to implement all of these points – if you’re looking to make your company’s customer service experience more efficient or want to cut down on the costs of maintaining the operation in-house, outsourcing your customer service could be the answer. Maintaining an open line of communication between service staff and management is one of the most helpful things you can do. The impact of your representatives’ work on your company is undeniable, so it’s essential to treat them with respect by communicating well. The more comfortable your representatives feel about communicating with management, the greater insight management will have into making positive decisions for the staff overall. Having good relationships between management and your service team helps maintain morale, motivation, and support. It’s easy to lower staff morale by accidental negligence. Make sure your staff has the equipment and resources to do their job correctly. Poorly-performing equipment (phones, computers, workspaces) can lead to delays and lower service quality, potentially decreasing customer satisfaction. Ensuring that your staff has the proper resources to do their job can motivate them to do their best work, which benefits everyone involved. You don’t have to wait for your employees to burnout to get them back on their feet. When in doubt, provide clear communication, support, and make sure they are taken care of. Additionally, you can ensure that you have a customer service team that is treated well and equipped with the proper resources by outsourcing your customer service work with a company you trust.